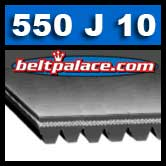 550J10 Poly V/Micro-V Belts. 550J10 POLY-V BELT. 550J10 POLY-V BELT. 55" L x 1" Wide, 10 ribs. J Section. (Measurement shown is for Outside Circumference.) Our biggest seller for multiple applications. These V-ribbed belts are designed to replace OEM belts on extra heavy-duty applications and fitness equipment.